Such a busy couple of months (is it May already?) and I have been a very lucky grandma. March 17 I came in first at Janice's tournament in Bellmore. I felt very lucky that morning and was on my game all day - making the Big Hand pushed me over the top! Shout out to Janice Windwer, who runs a great fundraiser. One week later the new card came! Now I have to start all over again! 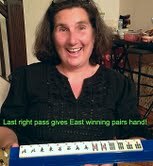 April 8 I went to Florida and, lucky me, I found the South Florida Mahjongg Club. Even though I was an hour late because my GPS sent me to a different library, I was given a warm welcome and played with some wonderful ladies. Shout out to Lynne Kaplan! She is a patient teacher and really puts her heart into it. On Friday, April 17, at our regular game, I was dealt another crappy hand and decided to keep winds. One thing led to another and suddenly I, who was East, had mahj before a tile was even thrown! How cool is that?? Shout out to Arlene Conboy who took my picture and captioned it (see above) as proof, and to Georgie Katz who passed me a N,E,6 bam to give me mahj! I was recently contacted by the New York City Parks Department and asked if I wanted to develop a "mahjongg hangout" at Bryant Park in midtown Manhattan. Are you kidding???? The park already has a number of games (see http://www.bryantpark.org/things-to-do/games.html) and is looking to attract players to learn and play. Already my mind is turning - is this my Major League Mahjongg dream come true? Queens v. Manhattan, World Series!! Lessons start on May 30 - check back for more details. Till next time - Happy mahj! !